We love our pets, and our pets love us. 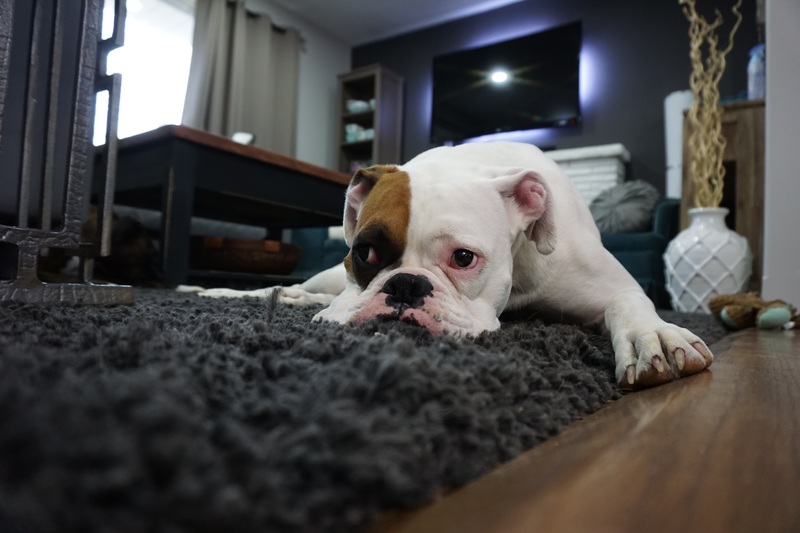 Unfortunately, that love doesn't always translate to our furniture, which can take a beating courtesy of dogs, cats and other critters we welcome into our homes. When buying furniture, it's wise to keep your pets in mind by looking for home furnishings that are as pet-friendly as possible. Read on for 14 tips for buying furniture that'll stand up to your furry friends. 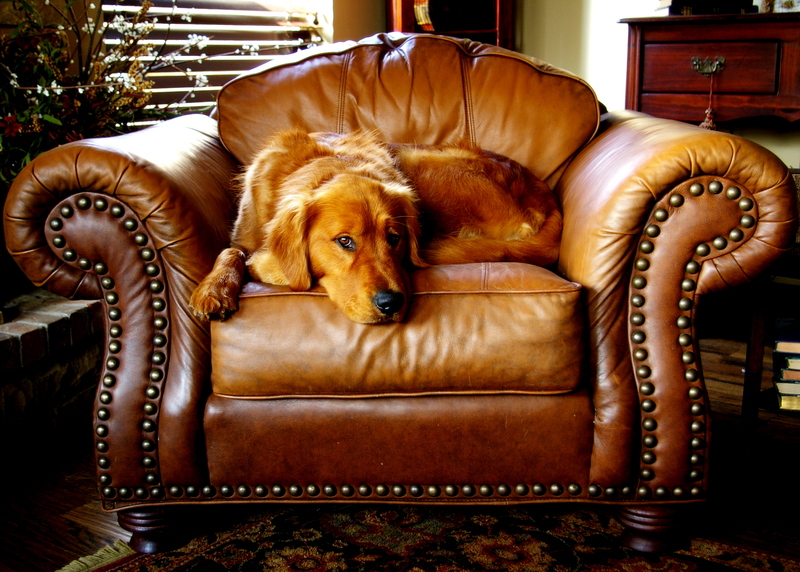 It may sound crazy, but think about buying couches and chairs that are the same colour as your pet. That way, you won't be obsessing over every piece of fur they shed on the sofa, because you won't notice it — it'll blend right in (until you get around to vacuuming it up, that is). Does that sofa you have your eye on have zippers on the cushions? It really should — zippers on the smaller cushions and larger seat cushions allows the opportunity to remove any sections that may become accidentally soiled and clean them individually. You can even take the covers to the dry cleaners, something that would be impossible with a couch that didn't have zippers. You may love the look and texture of natural fibres on a sofa, but think again. Stains and smells tend to linger in natural fabric, while wool has an unfortunate tendency to wrap animal hair into the weave of its own fabric, making cleanup a daunting, nearly impossible chore. Synthetic fibres, on the other hand, are typically non-absorbent, preventing liquid accidents to penetrate so you have time to clean before it turns into a nasty stain. When furnishing your bedroom, make sure you get machine-washable bedding that won't become worn and frayed with weekly washings. In addition, a thick, durable mattress pad will go a long way in protecting your mattress from any pet-related accidents. Add a few throw pillows to your favourite sofa or chair — because it tends to deter pets from sitting on said sofa or chair. Plus, if a pet does make a mess, the pillow is likely to incur the brunt of the damage, and it's a no brainer that a cushion cover is easier to clean than an entire couch. If you have a larger dog (or dogs), you're asking for trouble if you go with fine-lined, flimsy furniture. Instead, look for sturdy pieces that can accommodate a rowdy puppy or two jumping around on it until collapsing in an exhausted heap. Patterned furniture may help to camouflage pet hair, dirt of stains caused by your four-legged friend. If your decor lends itself, look for a design with small blocks of pattern, which may be able to disguise any pet damage. One great way to keep animals off your furniture is to get them some comfy, inviting furniture of their own. Investing in a plush pet bed could discourage a dog or cat from climbing up on couches and chairs — especially if the alternative you've provided is even more comfortable than where you sit. Wall-to-wall carpets and pets are a bad combination. Accidents will happen, and if you're enough of a stickler that you'll want to get your carpets professionally cleaned whenever they do, you're on a tough, expensive road. The best bet is hardwood flooring (or some other type of non-carpeted surface), which you can dress up with a rug — just make sure that rug is easy to clean. Dainty, finicky coffee tables and end tables are not the greatest idea when you've got a tail-wagging, excitable dog living in your home. When selecting tables, it's better to go with something strong and sturdy that isn't likely to be knocked over by that wagging tail. When picking up some charming throw blankets to accent your new furniture, make sure they're not made of a fabric so fussy it will be ruined if you toss it into the washing machine. With a pet in your home, it's wise to make sure that any blankets are durable and machine-washable. One of the wisest things to do when shopping for pet-friendly furniture is to steer clear of such fabrics as velvet, tweed, chenille, silk and other natural materials. They may look stunning in the showroom, but fabrics such as these apt to become stained and damaged courtesy of pets. If the budget is tight, instead of buying a new couch consider breathing new life into your existing couch by having a durable, washable (and, of course, attractive) slipcover made. If Fido makes a mess, cleanup is a breeze when all you have to do is remove the slipcover and toss it in the washing machine.